British Airways has sold the regional operations of its subsidiary airline, BA Connect, to Flybe - a move that will lead to about 900 flight cancellations. The airline said it would offer passengers alternative flights with either BA or Flybe, or a full refund. The airports affected include Manchester, Glasgow, Edinburgh, Birmingham and Bristol. The deal will create "Europe's largest regional airline", carrying 10 million passengers on 152 routes, Flybe said. BA - which will take a 15% stake in Flybe - saw its shares fall as much as 10% in morning trade on Monday, but recovered later in the day to close down 6.59% at 496.5 pence on the London Stock Exchange. The fall came after the US and Europe reached a preliminary "open skies" deal on Friday that could threaten BA's position at Heathrow airport and on the money-making transatlantic routes, analysts said. Flybe chairman Jim French said its acquisition gives the firm "critical mass" across domestic and European city markets, and created a business with more than £500m in revenues. 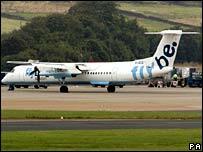 Flybe said its immediate focus was to "ensure the transition is managed effectively". Once that has happened it said it would be looking to list the firm on the stock exchange. BA said it would take an extra £20m charge on the sale due to losses at BA Connect. BA had taken a £106m charge when the deal was first announced in November last year. The airline said that the flights affected would be those that had been scheduled to run between 4 March and 24 March. Flights from Glasgow to Birmingham, and from Edinburgh to Birmingham and Southampton, have been cancelled. Other routes that will cease to run include Birmingham to Barcelona, Madrid and Berlin, Manchester to Madrid and Aberdeen, and Bristol to Munich and Zurich. BA will keep a number of BA Connect's routes, including the Manchester to New York service that it will run as part of its main operations. The airline added that a new subsidiary called BA City flyer will incorporate flights from London City to Edinburgh, Frankfurt, Madrid and Milan. Of the 15,000 passengers affected, some 6,500 will be given an equivalent Flybe flight, while the remaining 8,500 will be offered BA flights via London. "All passengers will be offered alternative flights with Flybe or BA via Heathrow to minimise inconvenience," BA said. "Alternatively, they will be offered the choice of a full refund." BA said all the routes being cancelled were "substantial loss makers" for BA Connect. "These routes need to be cancelled to protect the ongoing viability of the business," it explained. Amicus reacted to the sale saying it had become clear that BA did not intend to continue flying "what they saw as a loss making operation". But it added: "The transfer to Flybe has given our members the opportunity to have continued employment". Some 200 Amicus members worked for BA Connect as engineers and cabin crew. Amicus said that while there were some outstanding issues the union was "committed to working with Flybe management now and in the future". BA is also in talks to transfer its ground-handling operations at Aberdeen, Edinburgh, Glasgow and Manchester airports to Aviance UK, an independent services firm. The Transport & General Workers Union has reacted angrily to the move, saying members "have suffered real anxieties about their futures" since plans were announced to sell BA Connect in November. I'm part of a group flying from Birmingham to Madrid for a wedding on the 15th of March. Other members of the party had been informed their flights had been cancelled, yet I still haven't received formal notification. I ended up having to contact the airline myself to find out the flight situation. They then confirmed I was amongst those whose flights were cancelled. They have now since put me onto an alternative flight from Heathrow, however they've offered no compensation for the additional costs of getting to and from Heathrow. Poor showing BA. Just some courtesy like two weeks notice would have been nice. I am due to fly MAN - LYS 25 Mar returning 6 Apr. BA can't tell me (and presumably don't know) what's happening. My flights aren't including in the cancellation policy, and are not listed on the flybe site of flights that they are taking on. I have connecting arrangements at the other end. And, for the time being can neither replan, nor assume that the flights are going ahead. !!!! I've just started to use the Edinburgh to Southampton route as an alternative to Heathrow for meetings in the south west. Yet again BA start toying with their customers and think that it is acceptable to just cancel routes that are not profitable at a moments notice. "All passengers will be offered alternative flights with Flybe or BA via Heathrow to minimise inconvenience," BA said. As I am booked to fly from Birmingham, the airport being 5 miles from where I live, could Mr French explain precisely whose inconvenience he is minimising? Certainly not mine! Be unsurprised that this will be remembered the next time I select an airline to fly with, although why on earth I would want to fly at all on 'non-urgent' travel with all the current uncertainties and petty restrictions, is beyond me! BA let me know a week ago that flights I had booked for my elderly mother and a friend, for a special weekend treat in Barcelona (flying from Birmingham) had been cancelled. There were no alternatives with any airline on this route until a week later, when BMIbaby pick it up, and so we have had no option but to reroute via Heathrow, although no alternative travel arrangements to Heathrow have been offered. The weekend is turning out to be substantially more expensive, and far less comfortable for an already frail passenger than originally planned. As we had already paid for tickets to see the Cirque du Soleil as part of the weekend, cancellation wasn't really an option. I think BA have acted very shabbily indeed. I will certainly think more than twice before using them ever again. As a fairly regular traveller from Gatwick to Newcastle to visit elderly parents I now discover that the route has been completely withdrawn and will not be operated by Flybe. In my experience these flights were invariably almost full. Using other airports such as Heathrow is simply not a viable option for millions based South of London. I have in the past travelled on the same flight as MP's such as David Milliband, and I'd be interested to see what they think of this axing of a much needed route. I am now having to revert to train travel which is not as convenient. Perhaps the eco drive to get people off planes begins here, but it would be nice to have choice! It's about time that BA was rebranded London Airways as it serves no part of the UK other than London now. It should certainly no longer describe itself as our national carrier. I used to fly BA every week until their disastrous decision last year to become "no frills" by providing no onboard services whilst charging £500+ for a ticket. The fact that they could not make a profit by doing this speaks volumes about BA mismanagement. Everybody seems to be concentrating on the passengers - I'd like to know if anyone is even remotely concerned about the staff at these regional airports. Many members of staff have had the uncertainty of job losses hanging over their heads since mid-November when the sale was first announced. Their has been a distinct lack of information from BA on their future (or lack of one). Mainline staff handle Connect flights at some airports and management have been wholly inept at handling their queries over whether they will still have a job or not. I have a flight booked from Birmingham to Geneva in April, and Flybe, when I rang them this morning, seem to have no idea if it will be operating or not. Hardly good customer relations! I am a French person living in Solihull near Birmingham. My partner and I are planning to visit my parents who live about 80 miles from Lyon. Our BA Connect flight from Birmingham to Lyon on 7th March will be honoured by BA but we have to come back via Heathrow. The whole trip will involve a train and shuttle to Lyon, then the flight to London, then 2 tubes to get to Marylebone station, then a 2 hour train journey to Solihull, then a taxi home, all that with an 8 month old baby, luggage and a pushchair. Alleluia!! Businessmen will also waste a lot of time flying there indirectly or getting on trains. I can't believe that there will be no direct flights between the 2nd city in France and the 2nd city in England. There are flights to small French towns in the middle of nowhere and there should be no flights to Lyon? It just doesn't make sense. BA dropped out of the Southampton to Glasgow route last year leaving Flybe as the sole carrier. Guess what? The Flybe flights have since increased at least 50% (I was quoted £129 for an end of April flight). So I'll be taking Ryanair from Bournemouth to Prestwick instead - £23 for the same trip! This doesn't affect me directly as I already switched my flights from BA Connect when they announced the sale. The abandonment of regional airports is going to be a disaster for BA. London is not an alternative - it adds at least three hours to every journey, so I'm better off flying through Amsterdam or Paris. What's more, Heathrow is so crowded that there is almost always a delay. I've switched to Air France and am very happy. Withdrawal of BA services from Birmingham to Madrid, with no replacement from flybe, is deplorable and very disappointing. The option of travel from London is just not a viable alternative. The Madrid route was always well used, and if it was really a loss maker this must have been due to poor management. Why would anyone in their right mind want to travel to Heathrow to catch a flight when there is a perfectly good airport in Birmingham. I take many flights with BA but recently switched to Aer Lingus for my New York flights because BA don't fly from Birmingham, result! a call from BA asking me why I don't want to travel to London to catch their flight now there is arrogance for you. This has been going on for some time now, with nonsensical excuses ranging from technical issues with aging aircraft, to Easyjet poaching BA Connect staff pre-takeover. I fly weekly and it has seriously impacted upon my carrier choice to any destination. British Airways should be rebranded as London Airways given that the only non London route remaining following the sale of BA Connect would appear to be Manchester-New York. Why did BA not make a non London Airport (Manchester being the obvious choice) their 2nd hub rather than Gatwick. Long haul routes out of Manchester would surely have helped to keep the short haul routes viable with the additional feeder traffic, both domestic and European. I know of some Americans, who once they've been routed via Manchester, now always transit through Manchester on bmi then onwards with bmi's star alliance partner airlines rather than have to go through the transfer mayhem that is Heathrow. bmi, American, US Airways, Delta, Continental, PIA, Emirates, Eithad, Malaysian, Cathay, Virgin, amongst others have all been able to establish profitable long haul routes out of regional UK airports, why not BA? If the reports that Gatwick is also not profitable for BA are true, how long before they become Heathrow airways? In 2005 all direct flights to Paris were cancelled. Last year flights Glasgow via Birmingham restricted now Glasgow flights cancelled. Looks like us Scots are being given no alternative but to go through Heathrow to fly anywhere. Bad move considering the fiasco at Christmas. Fly British? Not likely as British is withdrawing flights and routes. This leaves the door open for a 'foreign' airline to offer a 'better'/only service. Competition too hot? As a person who travels widely and is an avid airline enthusiast also, unfortunately the airline industry as we knew it is becoming decapitated and severely handicapped. This "low-cost" and "saving costs" madness right, left and centre has got to stop. It's a real pity that BA doesn't try to develop another hub aside from London much in the successful way Lufthansa has done both at Frankfurt and at Munich; mind you, BA was never truly committed in developing another hub aside from London. In this way, Manchester - the UK's most important city after London in terms of tourism and business will go down the drain and the airport will be inundated with yet more shoddy low-cost carriers. Basically, it's a matter of time before disaster strikes through all this cost-cutting madness. Birmingham to Barcelona. Recently operated by an Airbus the flight was generally full. They took the air bus off and put a smaller aircraft on. This was always full. Now British Airways say that the route is not viable. ???? One would need to check the figures accurately but I believe the above is a reasonable reflection of the truth.